A Content is a service that provides access to data of a content provided by an implementation of the service ContentProvider. notifies changes of property values to listeners registered for those properties. can be used to add new properties to the content and to remove properties from the content dynamically. Note that the dynamic properties must be kept persistent. The service Store (UCB persistence service) may be used to implement this. If a property with an unsupported type shall be added a com::sun::star::beans::IllegalTypeException must be raised. This interface is deprecated, because a ContentProvider might need a XCommandEnvironment to perform the tasks of adding and removing properties. New implementations should implement the respective commands "addProperty" and "removeProperty" instead. can be used to notify properties removed from or added to the content's property set. provides access to the parent content of this content. The object returned by the implementation of the method com::sun::star::container::XChild::getParent() must implement the service Content. If the content is a root object, an empty interface may be returned. This interface must be implemented by a content which is a (logical) child of a content. must be implemented to make it possible to resolve cyclic object references. Those references i.e. may occur if there are listeners registered at the content ( the content holds the listeners ) and the implementation of the listener interface holds a reference on the content. If the content shall be released, com::sun::star::lang::XComponent::dispose() must be called at the content. The implementation of this method must call com::sun::star::lang::XEventListener::disposing() on the registered listeners and release the appropriate object references. At the other hand, the implementation of XEventListener::disposing must release its appropriate references. can be used to notify commands removed from or added to the content's command set. This interface must be implemented, if the implementation can dynamically change it's command set ( e.g. because the set of available commands depends on the value of a property of the content ). enables the caller to let the content execute commands. It is strongly recommended that any implementation supports the improved XCommandProcessor2 interface. Typical commands are "open", "delete", "getPropertyValues" and "setPropertyValues". Each content must support a set of standard commands and properties. Also there is a set of predefined optionally commands and properties. A content may define additional commands and properties. getCommandInfo XCommandInfo void This command obtains an interface which allows to query information on commands supported by a content. getPropertySetInfo com::sun::star::beans::XPropertySetInfo void This command obtains an interface which allows to query information on properties supported by a content. getPropertyValues com::sun::star::sdbc::XRow sequence< com::sun::star::beans::Property > aProps This command obtains property values from the content. Note: The execution will not be aborted, if there are properties requested, that are unknown to the content. The returned row object must contain a NULL value in the corresponding column instead. This command sets property values of the content. Note that setPropertyValues does not throw an exception in the case that one or more of the requested property values cannot be set. The implementation should set as much property values as possible. This command returns a sequence< any > which has exactly the same number of elements like the number of properties to set. Every sequence element contains the status for a property. The first sequence elements corresponds to the first element in the sequence of com::sun::star::beans::PropertyValue passed as command argument, and so on. The exceptions will never be passed to an com::sun::star::task::InteractionHandler. No value indicates, that the property value was set successfully. com::sun::star::beans::UnknownPropertyException indicates, that the property is not known to the content implementation. com::sun::star::beans::IllegalTypeException indicates, that the data type of the property value is not acceptable. com::sun::star::lang::IllegalAccessException indicates, that the property is constant (com::sun::star::beans::PropertyAttribute::READONLY is set). com::sun::star::lang::IllegalArgumentException indicates, that the property value is not acceptable. For instance, setting an empty title may be illegal. Any other exception derived from com::sun::star::uno::Exception indicates, that the value was not set successfully. For example, this can be a InteractiveAugmentedIOException transporting the error code IOErrorCode::ACCESS_DENIED. For folder objects, this command will return an implementation of service DynamicResultSet. com::sun::star::ucb::OpenCommandArgument::Mode: com::sun::star::ucb::OpenMode::ALL or com::sun::star::ucb::OpenMode::FOLDERS or com::sun::star::ucb::OpenMode::DOCUMENTS. The implementation of the open command MUST support all these modes! com::sun::star::ucb::OpenCommandArgument2::SortingInfo: contains sort criteria, if result set shall be sorted, otherwise it can be left empty. The execution must be aborted by the implementation of this command (by throwing a CommandAbortedException), if an unsupported mode is requested. For non-folder objects, the OpenCommandArgument2 struct will be prefilled with a data sink object, which will be filled with the content data. com::sun::star::ucb::OpenCommandArgument::Mode: com::sun::star::ucb::OpenMode::DOCUMENT or com::sun::star::ucb::OpenMode::DOCUMENT_SHARE_DENY_NONE or com::sun::star::ucb::OpenMode::DOCUMENT_SHARE_DENY_WRITE. Support for DOCUMENT is mandatory, all others are optional. com::sun::star::ucb::OpenCommandArgument::Sink: a sink, where the implementation can put the document data into. This command creates a new non-persistent content of a given type. This command must be supported by every Content that supports the property "CreatableContentsInfo", if the returned property value contains a non-empty sequence of creatable types. Note: This command is part of the replacement for the deprecated interface XContentCreator. execute command "insert" at new content. This command commits the data and makes the new content persistent. This command inserts a new content. It commits the process of creating a new content via executing the command "createNewContent" and initializing it via setting properties, afterwards. The command is not called on the content which created the new content, because the new object already knows where it is to be inserted (i.e. Calling createNewContent with the content type for a message on a News Group creates a content which internally belongs to the Outbox. Calling "insert" on that message will result in posting the article to the appropriate News Group). Not calling "insert" for the new content, i.e. because the user cancels writing a new message, simply discards the new object. No extra call to "delete" is necessary. On successful completion of this command, the parent of the inserted content must propagate the change by notifying a ContentEvent - ContentAction::INSERTED. Additionally this command can be called at any time to overwrite the data of an existing content. update void OpenCommandArgument2 aOpenCommandArg This command triggers an update operation on a content. For example, when "updating" a POP3-Inbox, the content for that box will get and store all new objects on the appropriate server. The inserted contents will be notified by calling XContentEventListener::contentEvent(). synchronize void OpenCommandArgument2 aOpenCommandArg This command triggers a synchronization operation between locally cached data and remote server's data. For example, when "synchronizing" a POP3-Inbox the content for that box will get and store all new objects and destroy all cached data for objects no longer existing on the server. The inserted/deleted contents will be notified by calling XContent::contentEvent(). close void void This command closes an object. undelete void void This command restores an object previously deleted into trash. It must be supported by objects which claim to be undeletable, but should never be called directly. search XDynamicResultSet SearchCommandArgument aSearchCommandArg This command searches for subcontents of a content matching the given search criteria. The command will return an implementation of service DynamicResultSet. Important note: A client that wants to transfer data should not execute this command, but it should execute the command "globalTransfer" at the UniversalContentBroker. This command is able to transfer all kind of content supported by that UCB. This command transfers (copies/moves) an object from one location to another. It must be executed at the folder content representing the destination of the transfer operation. Note that the implementation need not be able to handle any type of contents. Generally, there are good chances that a transfer of a content will succeed, if source and target folder have the same URL scheme. But there is no guaranty for that. For instance, moving a message from a folder on IMAP server A to a folder on IMAP server B may fail, because the transfer command can't be implemented efficiently for this scenario, because it is not directly supported by the IMAP protocol. On the other hand, moving a message from one folder to another folder on the same IMAP server should work, because it can be implemented efficiently. If an implementation is not able to handle a given source URL, it should indicate this by issuing a InteractiveBadTransferURLException interaction request. Source and target folder may be the same when doing a move operation. This mechanism should work for all transfer operations, but generally it's less efficient than the transfer command. lock void void This command obtains an exclusive write lock for the resource. The lock is active until command "unlock" is executed, or the OOo session that obtained the lock ends, or until the lock is released by a third party (e.g. a system administrator). This command removes a lock obtained by executing the command "lock" from the resource. Note that InteractiveLockingLockExpiredException might be raised by any command that requires a previously obtained lock. Adds a new properties to the content. PropertyCommandArgument::Property contains information about the property to be added. PropertyCommandArgument::DefaultValue may contain the default value for the property. Its type must match the one specified in com::sun::star::beans::Property::Type. Raises a com::sun::star::beans::PropertyExistException if a property with the same name already exists; com::sun::star::beans::IllegalTypeException if the property has an unsupported type; com::sun::star::lang::IllegalArgumentException if the Name of the property is empty. Note: This command is new since Apache OpenOffice 4.0, LibreOffice 4.2 and replaces the deprecated interface method com::sun::star::beans::XPropertyContainer::addProperty. Removes the properties from the content. Raises a com::sun::star::beans::UnknownPropertyException if the property does not exist; com::sun::star::beans::NotRemoveableException if the property is not removable. Note: This command is new since Apache OpenOffice 4.0, LibreOffice 4.2 and replaces the deprecated interface method com::sun::star::beans::XPropertyContainer::removeProperty. contains a unique type string for the content ( i.e. "application/vnd.sun.star.hierarchy-link" ). This property is always read-only. The ContentType should not be confused with the MIME media type ( MIME types ) of the content. Media types may be provided through the optional property "MediaType". The value of this property should match the information on creatable contents given by UCB contents that implement the property "CreatableContentsInfo". IsFolder boolean indicates, whether a content can contain other contents. IsDocument boolean indicates, whether a content is a document. This means, the content can dump itself into a data sink. Title string contains the title of an object (e.g. the subject of a message). AutoUpdateInterval long contains the interval for automatic updates of an object. It is specified in seconds. contains the types of Contents a Content object can create via command "createNewContent". If the property value can be a non-empty sequence, the Content must also support command "createNewContent". 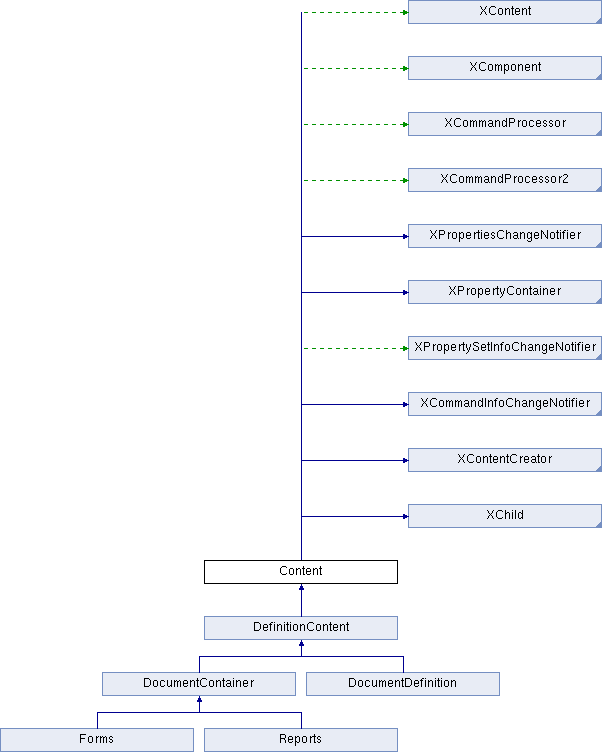 Note: This property is part of the replacement for the deprecated interface XContentCreator. DateCreated com::sun::star::util::DateTime contains the date and time the object was created. DateModified com::sun::star::util::DateTime contains the date and time the object was last modified. DocumentCount long contains the count of documents of a folder. DocumentCountMarked long contains the count of marked documents within a folder. DocumentHeader sequence< DocumentHeaderField > contains a sequence of document header fields (i.e. header fields of a MIME-message, or the document info of an office document ). For some standard header fields there are predefined separate properties, like "MessageTo". DocumentStoreMode DocumentStoreMode contains information about the way a folder stores the contents of (remote) documents. FolderCount long contains the count of subfolders of a folder. FreeSpace hyper contains the free space left on a storage device. It is specified in bytes. HasDocuments boolean indicates whether a content has subcontents, which are documents. HasFolders boolean indicates whether a content has subcontents, which are folders. IsMarked boolean indicates whether a content is "marked". IsRead boolean indicates whether a content has been "read". IsReadOnly boolean indicates whether a content is read-only. IsSubscribed boolean indicates whether a content is subscribed. IsTimeLimitedStore boolean indicates whether the feature to store contents depending on their age is active. UpdateOnOpen boolean indicates whether (sub)contents shall be automatically updated every time a (folder) content is opened. This property may be used to control whether a folder content should read data only from local cache when it is opened, or whether it should connect to a server to obtain latest data. Keywords string contains the keywords of a document (e.g. the value of the "keywords" header field of a news article). MediaType string contains the media type ( MIME type ) of a content. It is highly recommended to support this property if the content's implementation can obtain the media type natively from its data source ( i.e. HTTP servers provide media types for all their documents ). MessageBCC string contains the BCC (blind carbon copy) receiver(s) of a message. MessageCC string contains the CC (carbon copy) receiver(s) of a message. MessageFrom string contains (the address of) the sender of a message. MessageId string contains the ID of a message. MessageInReplyTo string contains the "In-Reply-To" field of a message. MessageReplyTo string contains the "Reply-To" field of a message. MessageTo string contains the recipient(s) of a message. NewsGroups string contains the name(s) of the newsgroup(s) into which a message was posted. Password string contains a password (e.g. needed to access a POP3-Server). Priority Priority contains a priority (i.e. of a message). References string contains the "References" field of a news article. Rules RuleSet contains the rules set for a content. SeenCount long contains the count of seen/read subcontents of a folder content. ServerName string contains a server name (e.g. The name of the server to use for a POP3-Account). ServerPort short contains a numeric server port. Size hyper contains the size (usually in bytes) of an object. SubscribedCount long contains the count of subscribed contents of a folder. SynchronizePolicy SynchronizePolicy contains the policy to use when synchronizing two objects. contains information about the target frame to use when displaying an object. TimeLimitStore short contains the value to use if the property "IsTimeLimitedStore" is set. VerificationMode VerificationMode describes a verification policy. is an enhanced version of XCommandProcessor that has an additional method for releasing command identifiers obtained via XCommandProcessor::createCommandIdentifier() to avoid resource leaks. For a detailed description of the problem refer to XCommandProcessor2::releaseCommandIdentifier(). provides access to the identity and the type of the content and allows the registration of listeners for ContentEvents. creates a new folder in another folder somewhere in the local file system). A content is "new", if it does not physically exist before creating it using this interface. This interface is optional. It should be implemented by contents which shall be able to create new objects. This interface is deprecated. Use property "CreatableContentsInfo" and command "createNewContent" instead.